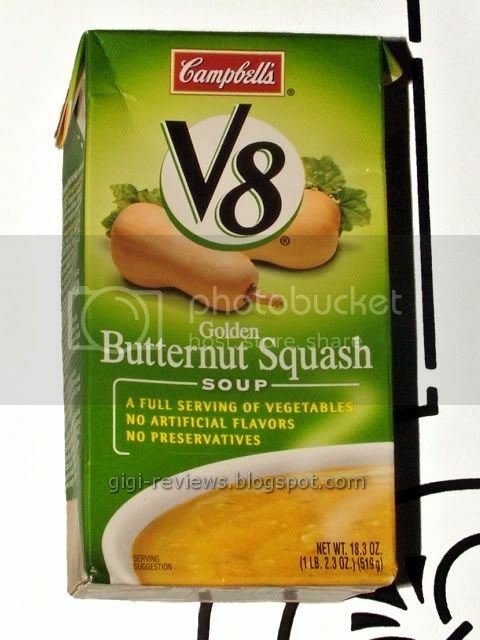 Since we announced the winner of the Campbells V8 Soup Give Away yesterday, I thought this would be a great day to bring you another V8 soup review! 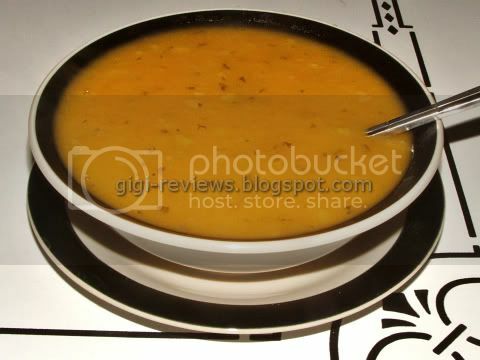 I love butternut squash soup, and Campbell's has some big shoes to fill on this one. My all-time favorite B.S. soup (yeah, there's that 12-year-old again) was the soup served at the now-defunct Wolfgang Puck Café chain. (They were popular here in Southern California for about two weeks...in 1996). Well, let me tell you, it was perfect. That stuff that Wolfgang is selling in a can does not even come close. I don't care what they say, something is different. The texture is creamy but not perfectly smooth. It's not lumpy, mind you...maybe "rustic" would be a good word for it. You get little chunks of veg and the slight grain of the squash. It makes it seem more like homemade. The soup is sweet and mellow. You can really taste the carrots that are in it. The squash tastes fresh and ripe, like a nicely baked squash -- not at all like that nasty frozen squash puree that haunts the frozen food aisle (and my childhood nightmares). 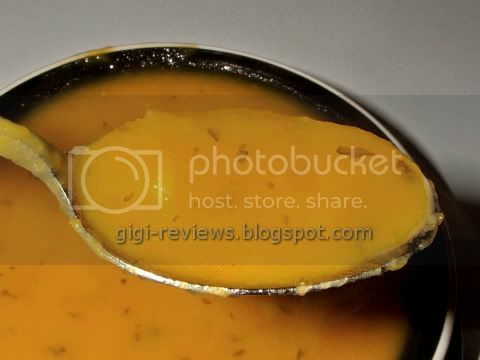 One thing that stands out is the richness of the soup. I can see that there is cream in the base, but it's the flavor of butter that stands out. Again -- how could butter possibly be bad?! There is also herbage floating in the soup. If I had to guess, based on the label, I would say it's parsley. Honestly, I couldn't tell. But it looks pretty. All around, this is about as good a soup as you'll ever find in a supermarket. Wolfgang may still have my heart, but this soup is definitely gunning for his spot.